You are at the beach during your vacation. Everything is peaceful and in harmony. Out of a pure love of life, you start to build a sand castle. Wait...what are your neighbors doing? Everywhere, sand castles rise up, but it was you who wanted to build the best, highest, biggest sand castle. Suddenly, everybody is in the middle of a competition. Everybody builds by themself with the materials on hand. Who will deplete all their materials and win the sand castle competition? Every player for themself, and all against each other, that's what's going on here. Frequently, you can "off-load" on your neighbors some unwelcome materials, but ultimately you are your own builders and only the player who uses their options best wins! Deck-building is over; Fine Sand is deck deconstruction! Fine Sand uses the "Fable Game System" introduced in Fabled Fruit, and in addition to a stack of starting cards, each player receives a presorted stack of Fable cards. With these cards, you change your card stack from game to game. Continue to play, or reset and play the game again with the same or different groups. 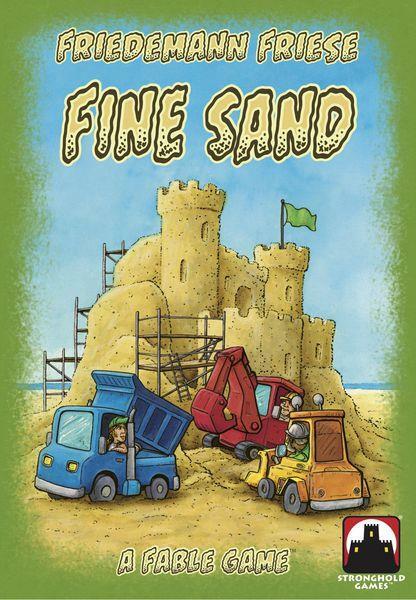 Fine Sand includes an addictive solo campaign!